I’ll bet some of you have lost a tooth or two. Raise your hand if you’ve lost a tooth. One? Two? More? Well, as this book begins Katie Woo has her very first loose tooth, but it doesn’t want to come out. Katie and her friend eat some popcorn, and her friend's tooth falls out. But what happens to Katie's tooth? Nothing! She thinks if she heads the ball in soccer that it will shake her head enough that the tooth will pop out. But what happens to Katie's tooth? Nothing! She brushes and brushes her teeth super good, ready for that tooth to come loose. But what happens? Nothing! She goes to school and the teacher has a chart that everyone can mark on with how many teeth they have lost, but you know what Katie can put on the chart? Nothing!!! But if you've lost a tooth, you know that eventually it has to come out at some point. 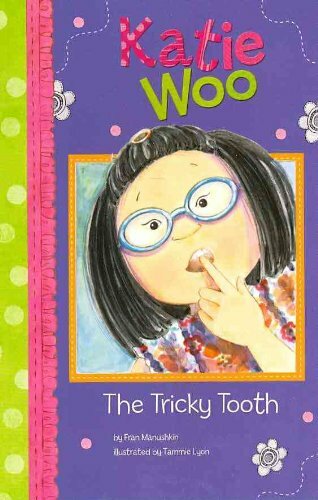 Find out what finally gets it out in Katie Woo: The Tricky Tooth.